Yesterday evening during dinner on the porch I glimpsed what I thought could be a Monarch, so this morning I headed out to investigate. In the northwest corner of the garden this solitary butterfly was enjoying nectar from the few remaining Zinnias. This entry was posted in garden and tagged Monarch butterfly (Danaus plexippus), nature photography, zinnia on October 4, 2013 by pbmgarden. Gorgeous shots. We haven’t seen any this year, and we miss them. This was our first. Their numbers are slim this year I understand. Even more so in real life. I was excited to see it. I would so love to go to Mexico and see the thousands, millions of butterflies all together there. Until a friend visited a few years ago I’d never heard of migrating butterflies. Yes, what an experience that would be. 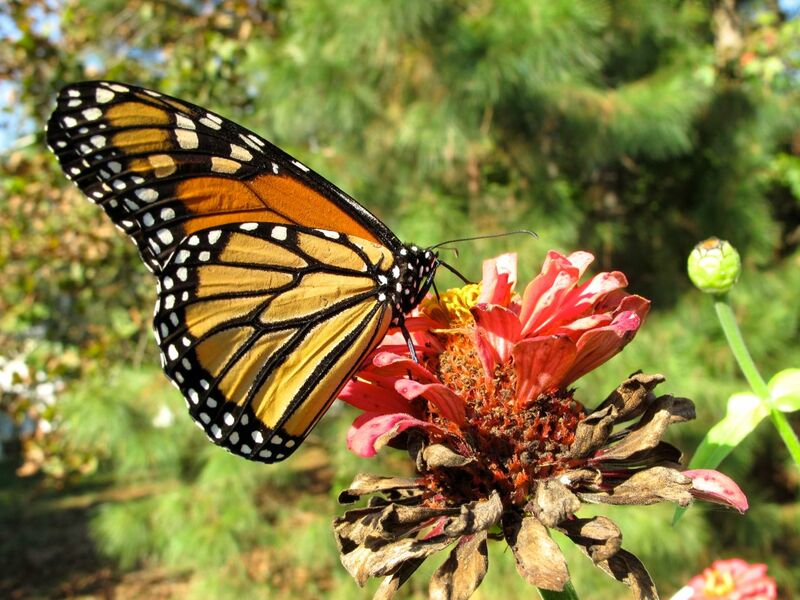 Just heard small-scale logging in Mexico continues to threaten the nesting sites of Monarchs and reduction of Milkweed plants in the U.S. means they are losing the plants on which they lay their eggs. We’ve lost so many since 1997–now only one-fifteenth as many butterflies as there were then. Shocking really. 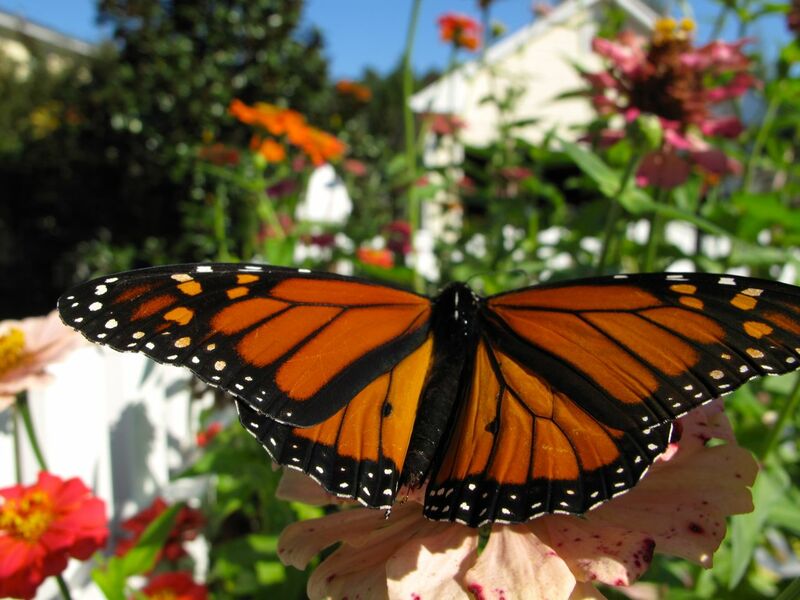 Beautiful – I have not seen any Monarchs since August. 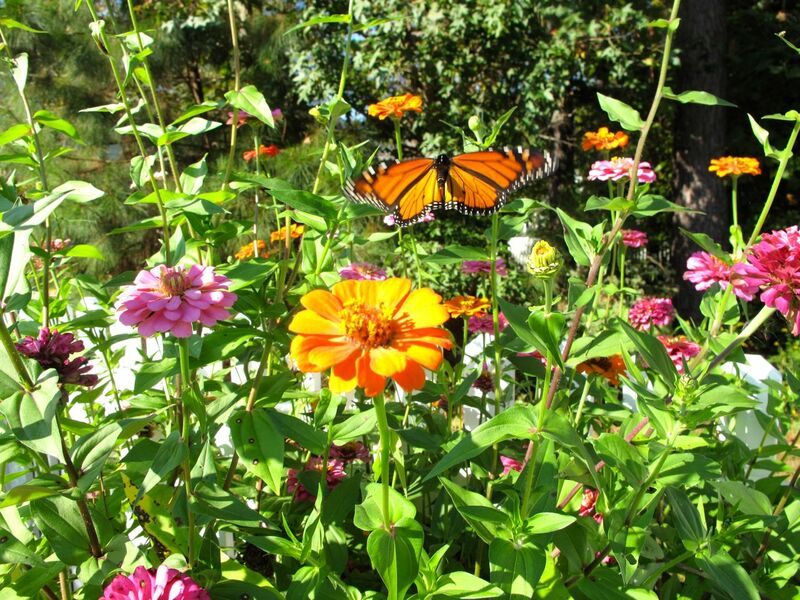 Zinnias do make really great flowers for butterflies. So they hang out in your area during the summer? They just seem to show up here in the fall. I need to plant more zinnias next year (and deadhead and water them too!). Great pictures, after a summer of maybe two sightings the monarchs must be moving through Pa on their way south. I saw a dozen scattered through the garden yesterday and a few still today. They’re so relaxing to watch as they float around lazily. I can’t imagine how they make it all the way to Mexico! That’s exciting to see so many. I’d love to see more of them. It is amazing the challenge they face to survive. Absolutely gorgeous photos! 😀 I am going to try growing Zinnias next year, as they seem to attract so many beautiful creatures. Thanks–I enjoyed trying to photograph this Monarch.Such a pretty creature! I recommend zinnias-around here they grow easily and bloom all summer, lasting until frost. Such a beautiful butterfly and super photos of it. Migrating time must be a wonderful event, I have seen it on TV, but would love to experience it myself, maybe one day! Thanks Pauline. It must be exciting to see the peak migration. I have seen migrating dragonflies in Florida and it was indescribable. 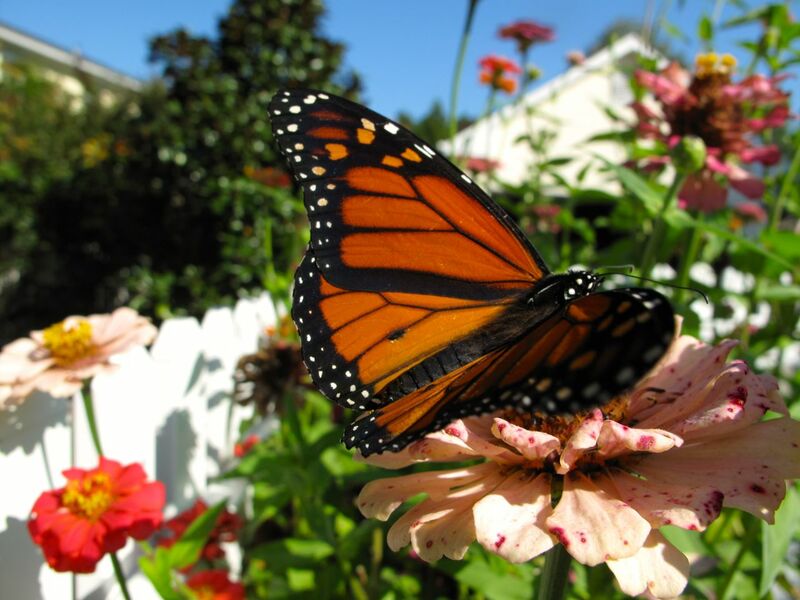 I’m learning that garden creatures can be pretty amazing; I think the Monarchs are awesome. I’ve seen only a couple of Monarchs this year despite letting the Milkweed grew. Hopefully this one in your garden makes it down to Mexico safely. That’s sad. I saw one other Monarch the next day about ten miles away. Those aren’t good numbers. How lovely to see these beauties migrating your way…there is hope when we see them. No further sightings though since that one.